The resurrection event that changed everything—on both sides of the Judaic-Messianic bridge. What an orthodox rabbi and Jewish scholars have to say about the resurrection of Jesus (Yeshua). The world’s history has long encompassed extremes—light, darkness, goodness, evil, sagacity, folly, hope, discouragement . . . and the ultimate dichotomy, death and resurrection. It’s the stuff authors love to write about, carefully mirroring this up-down, soul-matrix existence in their art, which sometimes winds up reflected back into life. Remember the seesaw duality of Dickens’ A Tale of Two Cities? Thankfully, G-d doesn’t leave us out to dry in our fractured state of humanity. We will rise from the abyss of death. He not only made a way for us to know Him and have a genuine relationship with Him—He’s also pulled back the veil several times to give evidence of the hope that is on the horizon: the bodily resurrection at the end of days—acharit hayamim [אחרית הימים]. But G-d gave us ten resurrection accounts—seriously, count them—to encourage us. Three in the Hebrew Bible (Tanakh) and seven in the New Testament (Brit Chadashah). Resurrection is the bedrock of traditional Judaism and Messianic Judaism/Christianity. And yet, all those resurrection accounts beg the question. to many of those accounts . . .
but discount one resurrection in particular? Namely, the historical resurrection of Jesus. Well, one modern-day orthodox rabbi didn’t. Nor did some other Jewish biblical scholars and rabbis. Clearly a non-messianic, Lapide had a real bridge-crossing view. He even wrote a book in 1979 about it: The Resurrection of Jesus: A Jewish Perspective. It made quite a stir back then, even garnering attention in Time magazine’s religion section. Lapide (1922-1997) and his scholarly process were all about rediscovering the Jewish aspects of early Christianity. After all, Jesus (Yeshua) and his followers were Jews. Now I don’t agree with his inference that Jesus (Yeshua) is only the messiah for the Goyim/Gentiles—although there was a time I danced around that tune, but 300 fulfilled prophecies can’t be ignored. Yet, Lapide’s convincing arguments in favor of Jesus’ resurrection as a historic event are worth noting. Per Lapide, the “Hebrew Bible knows of the translation of Enoch (Genesis 5:24), a transfiguration (Saul: I Samuel 10:6), an ascension (Elijah: 2 Kings 2:11) and three resurrections [which G-d] carried out through the hands of His prophets.” Namely: I Kings 7: 17-24; 2 Kings 4:18-21, 32-37; 2 Kings 13:20-21. Not a single case was met with unbelief in Israel, per Lapide. Lapide also commented that postbiblical literature gives reports of several miraculous healings, multiplication of bread, diversion of a flood, victory over demons, rainfall after prayer, etc. wasn’t a bizarre, non-Jewish event. And it wasn’t so-called magic or a scheme. From the hand of Adonai, G-d Himself. Jesus appeared to his disciples, others, and over 500 people at once. In addition to Lapide’s scientific analysis of Jesus’ resurrection—which includes support for the genuineness of Saul Paulus’ Damascene experience—he mentioned two other points as further support: (1) G-d permitted the women to be the first to witness and give testimony of that resurrection—when they held no value in the culture; (2) many Jewish believers were willing to die defending their belief in Jesus’ resurrection. He also addresses the hotly debated three-days-in-the-tomb issue. Even Christians battle out the calculations. But Lapide gives a smart Judaic response: It’s not a literal expression in the Hebrew Bible. Lapide says, for those with ears biblically educated, that three-days-in-the-tomb expression refers to the clear evidence of G-d’s mercy and grace that is revealed after two days of affliction and death by way of redemption. And also per Lapide’s book (pages 137-138, 142), the spiritual heirs of those Pharisees—today’s Jewish rabbis and biblical scholars—have commented on the matter from different angles. Without the Sinai experience—no Judaism. Without the Easter [Passover/Crucifixion/Resurrection] experience—no Christianity. Both were Jewish faith experiences whose radiating power . . .
were meant for the world of nations. was necessary to carry the message of Sinai into the world. Egged on by Jewish authorities and decreed by Rome’s Pontius Pilate, Jesus was crucified at a place called Gulgotha, outside of Jerusalem. 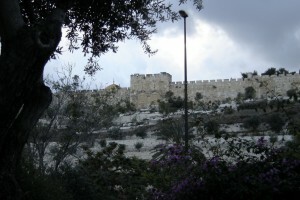 Pilate had a sign posted on the cross in three languages, Hebrew, Latin, Greek: Jesus of Nazareth, the King of the Jews. Two criminals were crucified that day as well, one on either side of Jesus. It was Friday, a day of preparation for the Shabbat [Sabbath]—a special one because it was Passover week. The Jewish leaders didn’t want the bodies hanging there the next day, so they asked Pilate to hasten the deaths of the three men by breaking their legs. The soldiers broke the legs of the men on either side of Jesus, but when they came to him, they saw he was already dead. One soldier took his sword and pierced Jesus’ side. Immediately, blood and water poured out. He died without one of his bones broken, fulfilling Psalm 34. Joseph of Arimathea—a Jew, a man of means, a respected member of the council, and a follower of Jesus—asked Pilate for the body of Jesus. Pilate granted permission. 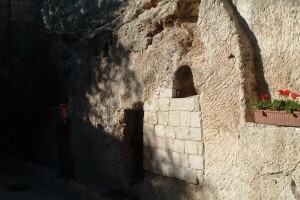 Joseph and another Jew, Nicodemus—a Pharisee, member of the Sanhedrin, and follower of Jesus (John 3)—took the body, wrapped it in linen sheets with the myrrh-and-aloes spices, in accordance with Judean burial practice, and placed the body in a new tomb (previously purchased by Joseph of Arimathea for himself), located in a nearby garden. Shabbat was nearing and they had to work fast. A huge stone locked the entrance—and Pilate had soldiers guard the tomb, worried about the stories of Jesus’ promised resurrection. But the stone was already rolled away. “Why are you crying?” the angels asked Miriam. “They took my Lord, and I don’t know where they’ve put him,” she cried. Just then, she turned and saw Jesus standing there. In the evening of the same day—the first day of the week—the disciples were gathered behind a locked door, fearful of the Judeans. He showed them his hands and his pierced side. Throughout the next forty days, he appeared to many people, per convincing proofs, and spoke of things regarding the Kingdom of G-d. He appeared to . . . Unlike the other resurrected people mentioned in the Bible, Jesus didn’t have to die a second time. He’d conquered death. He ascended into heaven, witnessed by his disciples: Simon (Kefa/Peter), Andrew, John, Ya’akov ben Zavdi (James, son of Zebedee), Philip, Bartholomew (Nathanael, Bar-Talmai), T’oma (Thomas), Mattityahu (Matthew), Ya’akov bar-Halfai (James, son of Alphaeus), Simon the Zealot, and Taddai (Thaddeus, also known as Judas—not Iscariot, but the son of James). While he was blessing the disciples, Jesus ascended into heaven, returning back to the Father. His followers evidenced him being taken up into a cloud (Acts 1). Right afterward . . .
“Men of Galilee, why do you stand gazing up into heaven?